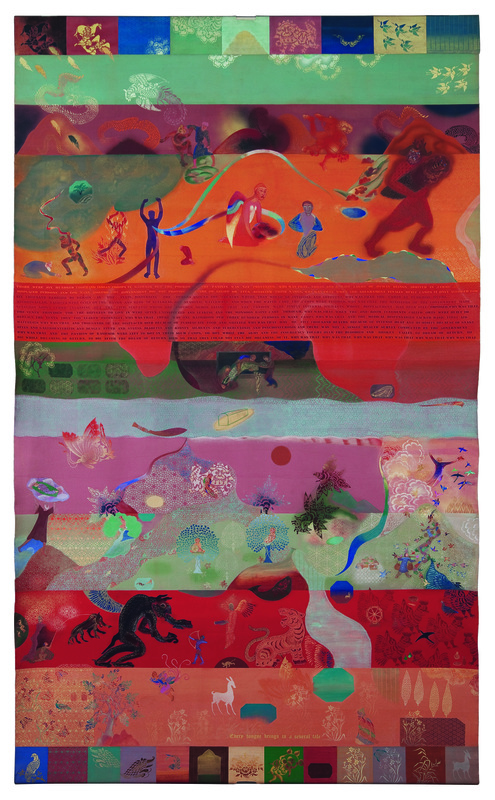 Nilima Sheikh’s scrolls and banners are exquisite depictions of scenes that can be as commonplace as women washing clothes or as informative as the story of a day in the life of a Mughal emperor. 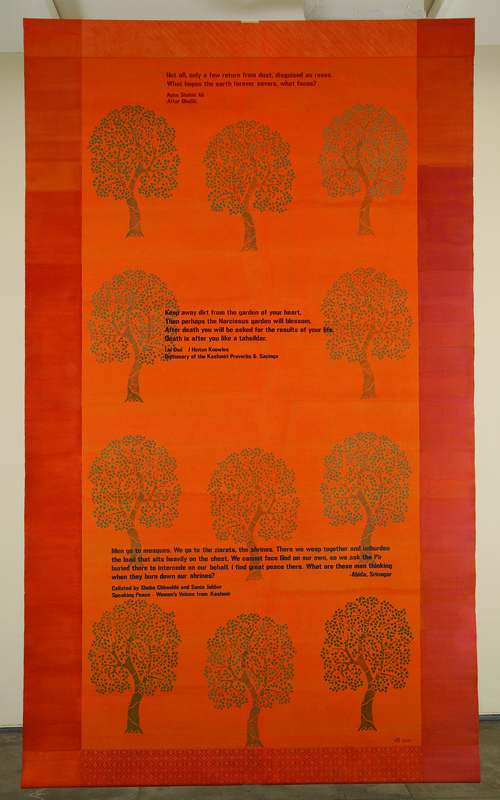 She works on a large scale and fills both sides of each huge panel with intricate designs and explanations, often stenciling the backs with poems, narratives, figures, and comments. 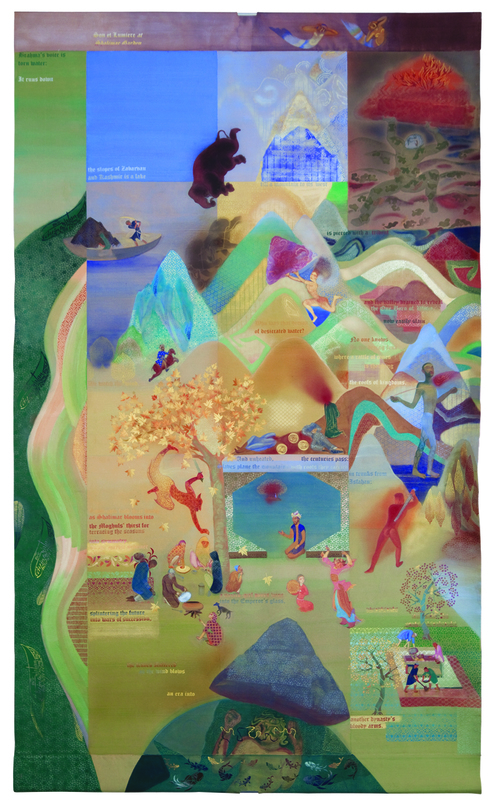 Although she was originally trained in Western-style oil painting, her work reflects folk tales, Indian and Persian miniatures, and Asian traditions of painting from China, Japan, Tibet and Sri Lanka, among other influences. 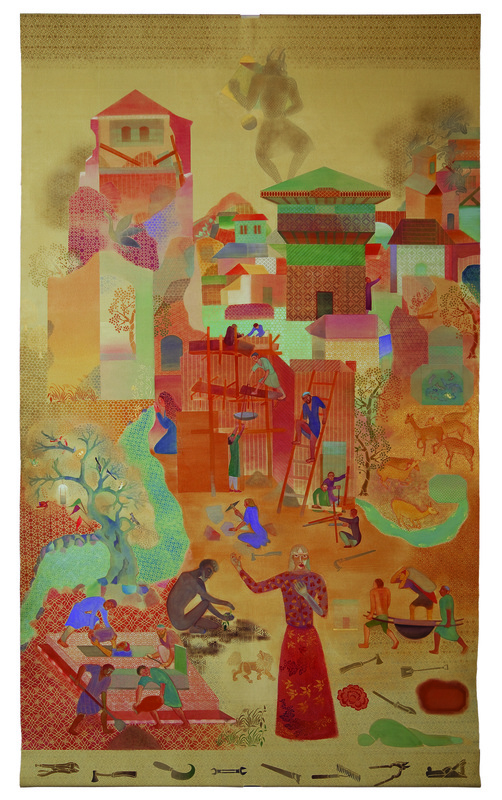 Painting in tempera, Sheikh produces colors that are pure, jewel-like, glowing and radiant. Her art is graceful, serene, ethereal. 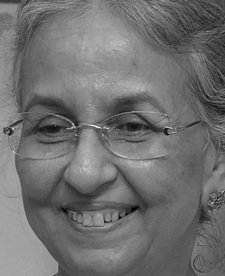 Nilima Sheikh was born in 1945 in New Delhi. She studied history at the University of Delhi (1962-65) and painting at the Faculty of Fine Arts in Baroda, (now known as Vadodara, the third largest city in the Western Indian state of Gujarat) where she received her MA in 1971. She taught painting at the Faculty between 1977 and 1981. 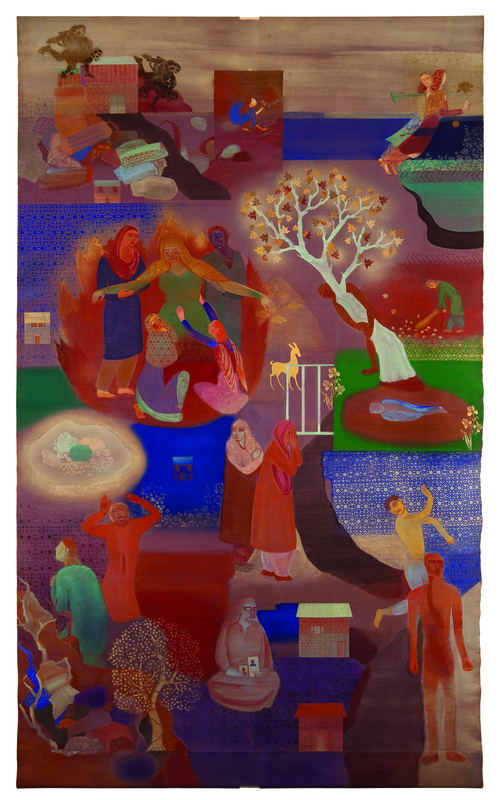 In addition to exhibiting her work in India and internationally, she has lectured and written extensively on art and has worked as a theater designer. Sheikh has participated in solo and group shows all over India and in China, Australia West Germany, Turkey, South Africa, Great Britain and the U.S. Sheikh lives in India. View More: Next piece "Kay WalkingStick: This Is Our Beloved Land", Home, Archive. Yes, truly exquisite and I love how they tell such tales. Thank you. Exquisite … I want to see more of her work.